​First, the story behind the photo: The sand dam was finished on Dec 22, 2016 (My birthday). On 11 Feb, water just showed up mysteriously behind the sand dam without any local rain. It rained 70 kilometers away and the residents thought it was magic through the witch doctor. Almost all (95%) of surface water had dried up and 80% of the animals (goats and cattle) have been lost because of a lack of water. People came from as far as 70 kilometers to get water from the 2 km that backed up behind the sand dam. This first water behind the sand dam was a godsend that saved lives of animals and people. The Literacy part of grant provides small, low-cost computers ($39.95) called raspberry pi, 146 Amazon tablets that are part of the raspberry pi system and 31 laptop computers. Raspberry pi can operate where there is no electricity, no internet and can be solar powered. Of the 9 schools in the GG, the 4 primary schools have no electricity. The raspberry pi contains a full E-learning library produced by World Possible with nearly 3000 videos, over 10,000 literature books, over 60,000 wikipedia articles, medical encyclopedias, etc. The Water part of grant has installed 5 large tanks at schools, a rainwater harvesting system, a sand dam, and a drip irrigation system. A growing area of 30 acres is located adjacent to the sand dam and has the drip irrigation system. With drip irrigation, the goal is to raise maize, and various vegetables. Food insecurity rate is 56%. Rainwater tanks of 225,000 was positioned deliberately within 1000 feet of a 12 year old Japanese drilled borehole that was not equipped to be active. Equipment has been installed and the borehole will be connected to the water tank. A 2nd growing area alongside the 225,000 liter tank will be established. The area of the grant is East Pokot, probably one of the poorest places in the entire world. The literacy rate is 4% and 60% of children never attend school ever. Area has a population of 150,000 and almost all are goat/cattle farmers. It is too dry for agriculture. Major goal is to change the people from pastoralists to farmers. Otherwise likely that people will die out due to droughts getting more extreme each year. Current drought is severe with no rain from 20 Jun 2016 till May, 2017. Area has an absolute poverty rate of 67% which means over 100,000 people have no material possessions. 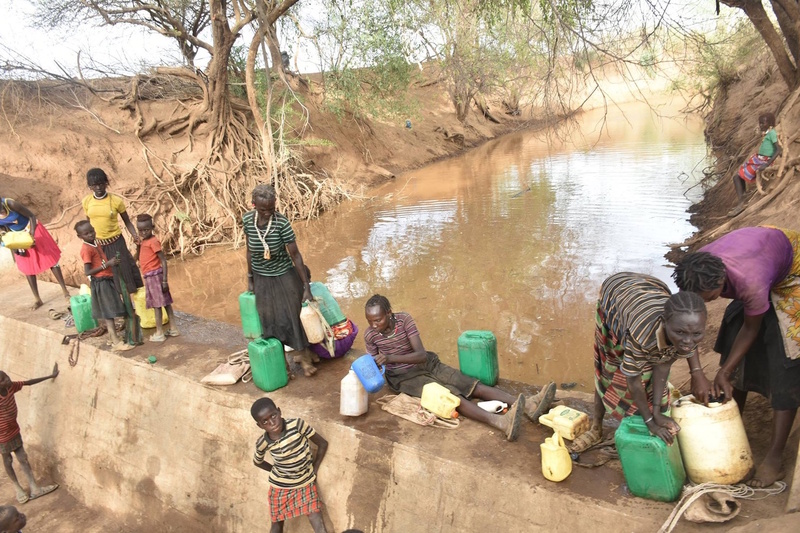 The Rotary Global Grant is spending twice as much on water projects as Baringo County is for 2016/2017. The project is having a major impact because of the success of the sand dam and the lack of support from either County or National Government. The sand dam stored 2 kilometers of water 2 months after the sand dam although no rain was received in East Pokot. It rained 70 miles away and the water traveled down the seasonal Natan river to the sand dam - see photo story above. A wonderful project with life-saving impact! For more information, contact Bob Cairns here.